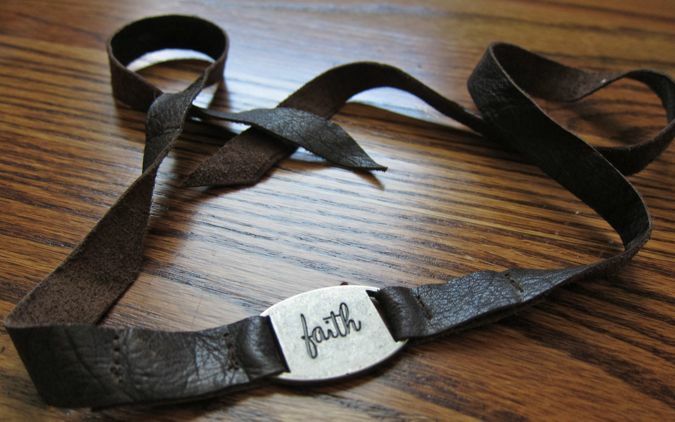 One strip of leather or fabric 34" x 1/2"
Two strips @ 17" x 1/2"
You can make this bracelet one of two ways. 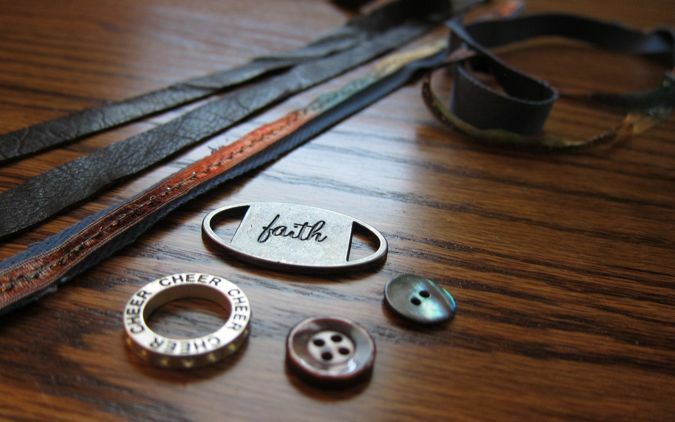 If you have a charm similar to the one shown below and your leather is 34" long, you will simply need to thread the charm through and center it. Seriously, that's it! ...you'll need to fold an end through each loop and stitch as shown. Ta Da! Now go wrappy wrappy and tie. Now. I have good news and bad news. 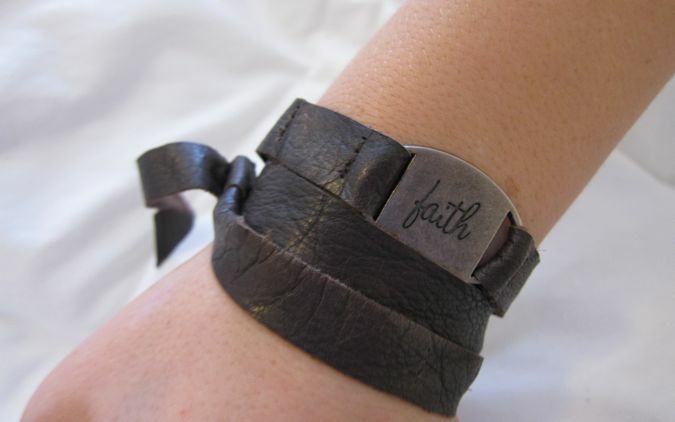 The model took the "faith" bracelet. 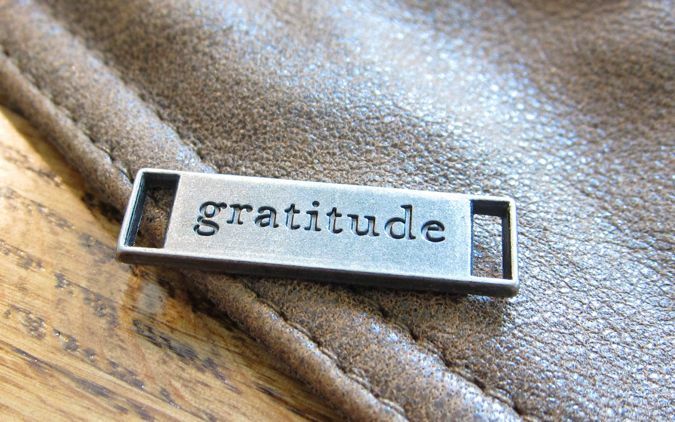 Good news: I'm making a sleeker, thinner, even BETTER "gratitude" bracelet to give away. What is it about your models? Or is that part of their pay? Love this idea! I am a follower, and put it up on FB. Right now I am wearing shorts, a top handed down from an aunt and a seed bead bracelet I made - no shoes. Haha! My model models. Then she cries, "I want this!" Then I turn to mush and give in. I'm a wimp. Excellent bracelets, I love them. I'm already a follower, I facebooked (is that a word?) and tweeted!. I am wearing pajama pants pink and white stripes and a peasant top with 2 holes in it but it is too comfy to throw away. In defense of my pj's at 6:30pm. We just got home from dinner at Chili's and daughter and I were covered in chocolate lava cake :-) Yum. That silly model of yours! LOL I am a follower! I just got home from work so I am wearing my yoga pants and a blue tank top. I will do all three: I am already a follower, I posted on my Facebook page https://www.facebook.com/pages/Beads-for-Busy-Gals/104432549617439 and righ now I am wearing gym shorts, a tshirt, and sneaks - we just took a family bike ride! I am already a follower, but don't participate in the other things, socially, so no worries if this places me out of the running. Just visiting to say hi and look at yet one more amazing creation of yours! I have on majorly worn in comfy denim capris and a v neck t with a ruffly flower embelishment thingy on the shoulder area and my hair pulled back up in a messy bun-ish thing with a scrunchy...oh yes, you read that correctly, do not adjust your screen I indeed said SCRUNCHY! 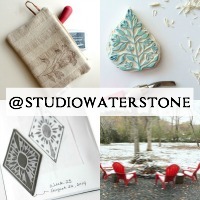 and I tweeted this fabbity fab giveaway too! What a fun bracelet. I'm a follower. It's almost 10pm - I'm in black pj bottoms but in one of my go to summer tops, a short yellow sleeve v-neck top. I just got back from my run so I'm wearing my sweaty running clothes and I'm chilly so I have my painting apron over my legs! 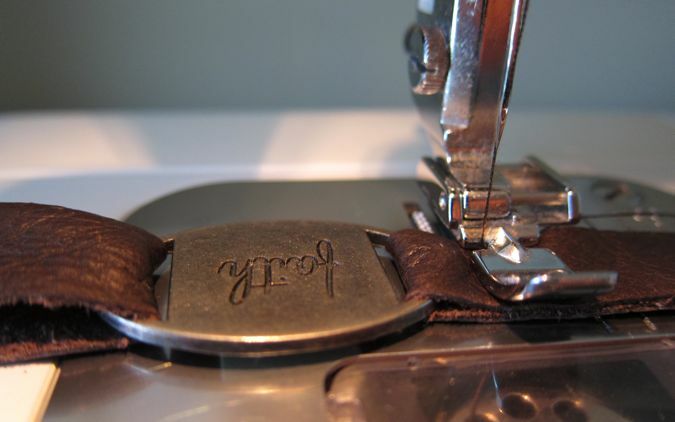 Can I sew leather with my regular sewing machine? I"m a follower...love your blog! Well I got up late today and I'm still in my night gown...bad Pam!!! So simple but really, really beautiful! What am I wearing? Right now? I'm already a follower. I tweeted this just now. I'm wearing sage green jeans, a rose colored tee, 3/4 length sleeved sweater, a bracelet I made this morning and my feet are bare! Oops. Forgot to say what I am wearing. A plum v neck tshirt with jean capris, bronze bejewelled flip flops that I scored on a serious sale, and my new 'simple truth' in a lacy filigree setting with my initial "E" on it. I am getting ready to start selling these. So far they have garnered quite the attention! Im a follower,, I love these wraps. Right now im wearing a creamy yellow 3/4 sleeve tshirt and black pants. And a sonic coke in my hand. I am wearing a turquoise green T-shirt and P.J. Pants! Hey I am a follower too! I just bogged about it too! Thanks for making me laugh tonight!! !